Alicia groaned as the electric pain faded, and the numbness set in. She had tried to stop the sound, but apparently what her body did wasn't her choice anymore. Blood from her cheek and tongue was starting to drip down the side of her face, and her eyes slid closed. It's an odd feeling, having literally everything in your body numbed, and Alicia almost preferred the shocks. At least then she knew she wasn't melting. She vaguely hoped that someone would glance down and help her, especially since she could smell something burning and had a nagging feeling that it was her feathers against the hot bars. Tiru sighed, tugging a bit at the collar. "So it's explosive, too. Pleasant." he said, rolling his eyes. "Do you know when the next fight is going to be? Or are the fights randomized." he asked, noticing out of the corner of his eye that Alicia began to stir. As he spoke, he hooked his left foot under her arm and dragged her away from the bars. "The pairings are randomly picked periodically," Smiles replied. He lifted his head and perked his ears. "Ah, good. Breakfast." On cue, the panel directly right of where everyone stood slid back and a bowl lifted up along with a replacement tile. Each food bowl had a top that when lifted revealed a heap of cold steamed rice mixed with leftover ramen broth. The concoction was so mashed up and greasy that it looked similar to rice gruel, except rice gruel would look easier to stomach. The plastice spoon was stuck on top of the mash meaning that you'd have to dig your finger in just to pull it out. In contrast, next to smiles an iron plate wedged into a wooden tray lifted up. On top of the tray was a sizzling hamburger steak topped with gravy and had a side of garlic mashed potatoes. Smiles took the silver fork in one hands while the other lifted up the plate just below his chin and he started digging into the mashed potatoes. Emerald clicks his tongue in distaste when Matthias claims leadership. Yeah right, like'd we'd listen to another guy who thinks he can lead. Certainly learned that people like that are horrible leaders. When Matthias attacks the bars Emerald hears, That's probably a bad idea, before he collapses. Not the leader type, is he? Definitely not. As the food arrives, Emerald turns to Smiles and asks, "I'm guessing your food has to do with having the sponsors you mentioned earlier, correct?" "Food time. Talk when I come back," Smiles grunted before shoving a forkful of mashed potatoes into his mouth and cuts into the hamburger steak using the edge of the fork. "Fair enough," Emerald responds before looking at his meal. He thinks, I'm not going to be able to stomach that. I can! Alright, but just for the meal. Yay! Emerald closes his eyes and gives control to Lapis, before opening his eyes again. Emerald's eyes are now tinted blue. Man, I love food! he thinks before starting to dig into the slop. Though the shock only lasted for a few seconds, it felt like an eternity for Matthias. After it faded, the pain was immediately replaced by an eerie numbness that reached deep into every fiber of his being. He lay motionless as the serum rendered his muscles useless, attempting to clear his mind and think straight once again. His eyes bore a blank expression, appearing to stare straight through the ceiling. His nose began to bleed, and a sliver of drool slid out from the corner of his open mouth. As time passed, his mind grew clear enough to at least listen in on the conversation taking place between his fellow prisoners. Aurelia placed a palm under her chin and sighed after things seemed to have winded down a bit. It should've taken at most one try to figure out that the collars seemed to suppress hostile actions against others. At least I hope it's the collars and not somebody watching our every move. She walked over to where the panel had opened up and grabbed a bowl of food. Peeking under the lid, she couldn't quite make out what it actually was. What is this? Maybe rice and...I don't even know. With a blank face, she turned to Emerald who seemed to be delighted about the food. Turning back to the bowl, she slowly put the lid back on before nodding once as if accepting her fate. With that out of the way, Aurelia decided to check the two bodies to see if they were even still alive. Seeing that they were, she dragged them to a spot near a wall that was away from the bars and the food and laid them side by side. It had only been a couple of minutes since their collapsing but she hoped that they were still fine. Standing over them, she looked each of them in the eye and simply tapped her finger against her head a few times before kneeling down beside them. I can't just let them die. I mean, we haven't even left this room yet! "I don't care if you don't approve. Just let me know when you're fine somehow." With that, she starting performing CPR for the pair in intervals she was hoping would be sufficient enough. Jacob had lowered his weapon as soon as he realized that Smiles was wearing one too, and despite feeling his ire rise at the girl being referred to as his girlfriend he swallowed his resentment. Kneeling beside Alicia he checked her pulse, frantic, but there at least, rolling her over, he wiped some of the blood from her face and made a brief attempt at clearing her airways. Then Auralia took over, seemingly more adept at this than he was. The wolf turned to the food that had now been presented to them, but ignored it for the most part, someone else could have his, probably one of the two that received a shock from the collar, they certainly needed it more than he did. "So when do we fight?" he growled, turning to Smiles. Leaning against the walls of the cell with his arms crossed, Nero said nothing as he watched Aurelia and Jacob attempt CPR on the pair. With neither pity nor scorn, he thought to himself, "It is perhaps better for them that they die now". It was not malice, nor was it apathy. It was simply a recognition of likelihood and fact derived from the years of experience Nero himself had had in the prisons. After watching for a little while longer, Nero went to grab the bowl of food, if it could be called that, that had been provided for the trapped prisoners. He anticipated the fights to start soon, and if he was to survive, he needed to eat well and build his strength for the fights. He was going to get sponsored, whatever it takes. Reaching in and grabbing the spoon, he dipped it into the gruel and lifted it high from the bowl, tilting so as the gruel would flow off the spoon and back into the bowl. Nero watched it flow with a small degree of repulsion. "It certainly wouldn't be the worst meal I've had" he thought to himself. He scooped another spoonful from the bowl and put it into his mouth. He was wrong. Alicia had been growing tired and unaware, because unbeknownst to her, her breathing was getting slower and less frequent. Her only way of knowing she was moved, apparently twice, was seeing the room move around her. Briefly, she saw Jacob turning her over and apparently touching her, from what she could see, but she was relatively indifferent toward the contact. Probably because her mind wasn't making sense. It as over soon enough, and Alicia saw a girl with grey hair drag her and another body over to the opposite wall, and the fleeting thought that her feathers were going to be impossible to fix crossed her mind. She struggled to see if she could feel her wings (she couldn't) and she couldn't even strain to see the grey-haired girl until she was giving her mouth-to-mouth. Alicia was sure that the feeling of air being forced into her lungs would be weird and uncomfortable, were she able to feel it, but at that moment she was just thankful that someone was trying to keep her alive. She just hoped she would close her eyes for her, as she hadn't blinked in about a minute, and that couldn't be good. Chewing and swallowing the last bite of his steak, Smiles set down his plate and clapped his hands together as if in prayer. "I am grateful for this meal," he muttered solemnly. "So what happens if we win in the arena? Will they give us our freedom?" Jacob already felt as though he knew the answer, and doubted their captors would willingly give up a source of entertainment and the opportunity for Lien. But if there was a way of getting everyone out alive, and preferably unharmed, he wanted to know about it. "Didn't you hear me before?" Smiles murmured grimly. "I said we can talk when I return." Suddenly the stomps of a pair of combat boots thumped outside of the bars loudly. A man stood there, wearing a navy blue military uniform. Over his head he wore a full head mask that had no face or features. On his ranks patch sewn onto his left shoulder were three hearts lined up diagonally. "Alright Smiles, your match is up," the faceless soldier said, jerking his head back. Smile rose up from where he sat and briskly walked towards the bars. 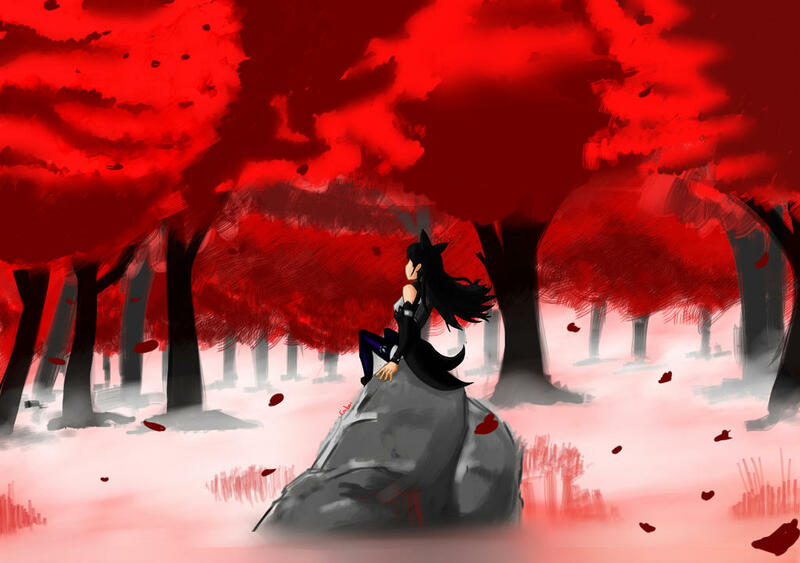 "After seeing how stupid and trigger happy you bunch are," the faunus commented grimly as he passed by each of them, "I should tell you all to not be stupid and try anything. I suggest you contemplate on what to do while I'm out." Smiles continued walking towards the bars without showing any sign of stopping or slowing down. Just when he was about to walk right into the searing hot metal, the bars moved aside creating a door-sized opening just in time to let him through and closed the moment he passed. Smiles and the guard disappeared from sight as an out bullet-proof glass wall slid in front of the bars. Suddenly a section of the back wall slid open in the direct middle, revealing a plasma screen TV monitor. Some time have passed, enough for the two on the floor to regain feeling in their system, and the monitor lit up, showing live footage off what looked like a coliseum made of metal. The arena was made up of hard dirt and rocks, simulating a a live battlefield terrain in the midst of all this metalwork. The seats were devoid of people. Instead they had active monitors, each one featuring a choice of avatar like in an online chatroom, even displaying a small username underneath each one. The monitors would turn towards eachother and speak among one another like real people. Then the bell rang and all monitors turned towards the arena just before the cameras all concentratedin the field. "Welcome one and all my prestigious guests," a voice announced over the speakers, "Welcome to our Underworld Death Battle. Tonight you have been promised a fight between crowd favorites. We give you a fight between Muscles and Smiles!" The screen was split, showing two different camera views. One side featured a large man standing over ten feet tall, his arms rippling with muscles. He wore metal plating over his beefy arms and gauntlets that looked like a pair of giant steel fists as wide as a normal man is tall with spiked knuckles. The man was bald but had a long, ragged beard that ended in a twisted tip and his teeth were shown clenched in a constant scowl. On the other camera was Smiles, although he wore a black and gray striped sweater vest and a long scarf with torn up, ragged ends. "You have all placed your bets, I'm sure," the announcer stated. "So let's get this party started. Tonight's match is a classic one on one. Gladiators will have full access to their semblance and weapons. There's no holding back!" As the announcer spoke, Muscles and Smiles were walking into the arena, facing each other from opposite ends. They squared each other off, cracking joints and shaking limbs in preparation. On cue, the two darted towards each other at full speed. The massive man suddenly sped up and zipped across the battlefield at impossible speed. The massive titan looked like he had knocked right into Smiles and plowed right over him, but when he stopped, Smiles was nowhere to be found. Instead, there was a whisp of smoke where he previously stood as if he had just been burned to ashes. Suddenly, particles of smoke gathered behind Muscle and solidified into the form of Smile, crouched on the giant's back like a cat. Raising his arms, Smiles swung down and dug his metallic claws into Muscle's back. The burly man roared and shook about until Smiles was tossed off, landing on his feet on the ground. Sliding off his back, Smiles left eight long scratches before he tossed off, but the wounds barely bled. As deep as they looked, they weren't more than flesh wounds to the giant. The huge man roared and swung down with one of his massive fists. They plowed into the dirt, leaving a fist shaped indent in the hard ground. The moment the fist was upon him, the faunus dissolved into smoke floated off. The particles gathered again, this time behind Muscles. Smiles clenched his fist and suddenly a long spike sprouted from his middle knuckle. With a frontal stab, he dug the spike into the back of Muscle's knees before ripping it out and jumping off to the side. Roaring out loud, Muscle forced himself to keeping standing and dashed towards Smiles in a blur of speed. Once against plowing into him, the faunus turned to smoke and the whisps seem to snake around the giant. Appearing again, the faunus had his arms wrapped around Muscle's neck in a headlock from behind. The giant tried to swing his body around trying to shake the faunus off but Smiles kept a firm grip. Dashing at high speed, Muscle slammed his back into the wall, busting a dent into the metal. This time the faunus did not turn to smoke and the audience awww'd at the painful looking attack. Muscles repeated, running into the opposite side of the arena and slammed into it. Then again. And again. The giant readied himself to charge once more, pausing briefly to ready his footing, but Smiles suddenly lifted a hand and dug his fingers into the man's eye sockets. The man's screams were bloody and gargled as he twisted about. Smiles turned to smoke again, only to reform on Muscle's chest, digging his metal claws into the sides of his chest as an anchor. Then Smile's shoes sprouted five S-shaped blades from the toes and dug into the giant's belly. Once more, the faunus bit down on the bigger gladiator's neck and with a bloodied squeal, the giant fell down on his back. "Finish him! Finish him! Finish him!" The crowd of monitors chanted in unison for several seconds before Smiles pulled back, ripping out the other gladiator's throat out. The crowd cheered loudly. Casually, the victor stood up and wiped the blood from his mouth. "Come one now!" the announcer shouted, "Give us that signature cheshire grin of yours." Smiles looked defiantly at the camera but then puts on a wicked grin, showing his gums and metal teeth. The crowd applauded and Smiles exited the arena, entering a dark entrance tunnel along with a pair of guards. The screen went off and the wall panels slide back over it, closing it off. "What sort of sick twisted game is this" Jacob snarled, once the fight had ended. His hands clenched into fists and he felt his choler rise "just wait until I get my hands on the person that put us here" he snarled, the threat wasn't empty despite its lack of imagination, Jacob never had been one for overly creative threats, his talents lay in making sure they weren't hollow. As feeling regained itself in Matthias's body, an aching pain set in. Attempting to hide his discomfort, Matthias shoved Aurelia away from him. "At least buy me a drink first," he said with a sly grin. Standing up, he let out a few groans as he stretched out his limbs to get his blood flowing normally again. Note to self, don't resist authority quite so obviously next time. Though he could move again, he still felt queasy, and blood continued to slowly drip from his nose. He had recovered just in time to catch a majority of the fight on screen. "I can't be the only thinking that if those two can't get out of here, we don't really stand a chance at escaping, right?" he questioned the group as he made his way to where the food was. "Save any for us?" he added, looking around casually before he noticed an untouched bowl. He pulled off the lid, and without giving the nasty concoction as second glance, began to scarf it down as if it were to be his his last meal. While it wasn't the worst thing he'd ever eaten, it was certainly close. Still, it was all they had, and he never really was too picky. It was a few more minutes before Alicia's limbs started tingling, gaining more and more feeling. When eventually she was able to sit up, her entire body was pins and needles. The sensation was unpleasant on its own, as she literally felt as if she were blinking in and out of existence, but she far preferred it to the pressing numbness. Working her hands and jaw, she tried to encourage the feeling back into them, along with moving her wings. It was slow going, but at least she could breathe on her own. Turning her face to the girl who had tended to her, she nodded and slurred out the words, "Thanh ou," with her still-numb tongue. Blood dripped out of her lips from the gash she'd chewed in her cheek, and she started coughing, as some of the blood had run into her lungs. Her hands ended up covered in blood, but she was no worse for the wear. She had come to her senses just in time to see the fight on the monitor, a steady scowl growing on her face. "Thith ith sthick!" She slurred, fists clenching with feeble force. She saw the food out of the corner of her eye, and looked toward it without the strength to reach for it yet. She would later wonder if the serum injected in her was taking a stronger effect because she was smaller than most. "We'll get out" Jacob grunted, turning to his fellow wolf "take mine if you want it, after what you went through you need it more than I do. Jacob paused for a few moments thinking to himself "I have an idea" he stated after a few minutes "these collars have got to have some sort of battery or fuel cell right? well, if we can run it dry, or if it's getting power transmitted, jam the signal. We could effectively shut them off, allowing us to use our semblances" he turned, looking at the rest of the group "although I couldn't ask any of you to do this" he gestured to Matthias and Alicia "you two came out pretty bad after the one shock, and chances are some of us will have to fight soon. That being the case, it'd have to be me" he folded his arms across his chest, awaiting the approval or dismissal of his idea. Tiru was silent as he watched Smiles leave. After a little while, a large TV revealed itself from the back wall, displaying an arena with metal walls. If I was sent out there, any fights I had to participate in would be a breeze if I had access to my semblance. he thought, listening to the announcer as he spoke. Eventually, Smiles and another combatant made their way onto the field. "So let's get this party started. Tonight's match is a classic one on one. Gladiators will have full access to their semblance and weapons. There's no holding back!" Wait... Active semblances? I could just drain this thing... But how would I get the rest out of here? he thought as the match began. The tamest way to describe such a thing would be "A macabre bloodbath that no living being should ever bear witness to." But Tiru needed to know how these fights operated, and watched to the end, shaking his head when the TV retracted into the wall. One of the other two wolves spoke up, saying that he would go next. Apparently he and Tiru generally had the same idea. But he had to go next. He had to test his semblance on the collar. "As selfless as that is, big guy, I think I'd better take the next one. I should be able to shut the collar down in the field." he said, standing up. "Besides. Hand to hand is my forte." he said as he drew the lights, igniting them with a cocky smirk on his face. After finishing his meal long ago, Emerald's eyes turned back to green. Luckily no one had noticed the changed. He watched the screen and the fight very carefully. Contemplating. Calculating. As he always does. When the fight was over, he continued to think about an escape plan. When Jacob and Tiru start to talk about their ideas for a plan of escape Emerald runs over and clamps his hands over each of their mouths before whispering to the both of them, "Ears are everywhere. Don't speak of your plans, or else they'll do everything they can to stop them." After saying this, he steps back from them, moving his hands away from their mouths before saying, "As to those two not being able to get out of here..." he pauses before continuing, "I believe they like being here." He let's that ominous sentence sit in the room, without saying more. Matthias had sat quietly as he chowed down on the 'meal'. As he heard the two boys discussing escape plan, he silently wondered why no shock had been administered yet. Shrugging it off, he finished the so-called food and began to lick up the scraps. His ears perked up at Emerald's explanation for the two beasts that had just fought. Matthias's head snapped up, a little food being knocked to the ground in the process. "Can you blame them? They get free food and a roof over their head. Also, I doubt they want to go through the pain of these collars." He shuddered a bit as spoke the last sentence. "It's not just that," Emerald replies to Matthias. "There is a certain look in the eye when someone loves to kill. I saw that in both their eyes. Outside this place, they wouldn't be able to do the same without getting in trouble with the law." Emerald walks back over to a wall and sits down, thinking to himself, We're going to be in here for a while. Do you think we'll ever get out? I don't know. Might as well make the most of it. Yes! Combat training! More fights! Tiru looked at the third wolf in the room, shaking his head. "They aren't us. They're used to this." he said as he continued planning his next move. Draining the thing should also disarm the injection system, as well as the bomb. Only telltale sign that the collar isn't active would be the light... Without another word, Tiru tugged his scarf out from under the collar, then tied it over the collar, completely hiding the light. Problem solved. Grinning, Tiru then leaned against the nearest wall, barely listening in on his cellmates' conversation. The bars slid apart then, leaving way for the cat faunus to get back into the cell before shutting again. "I don't suppose I can buy my room back?" Smiles asked dryly to the guard behind him. "Sorry animal. You're stuck sharing until they die off. Or until you die off. You looked a bit sloppy out there." With that, the guard walks away just before the glass wall slid down. Smiles sighed tiredly, shaking his head as he slumped over back to his corner. He leaned against it and crossed his arms. "So, you all probably have a lot of questions," he said dryly, scowling at the group. "You probably assumed a lot of things. You're an idiot. Never assume something. Know something. That's my only advice to you all here. You know what happens when you assume." Smiles lifted up his chin and tilted his head slightly, giving everyone a blank, emotionless, yet intimidating stare. "Now ask away. I'll answer three questions for free." Starring at the screen with still eyes, Aurelia what mesmerized at Smiles fighting style and noting everything that he was doing. Hopefully we don't have to fight him anytime soon. After the fight had finally ended, she turned to the others. "Well, if we get stuck in here, we will get used to it whether we want to or not." The prospect of being stuck down here wasn't exactly appealing to her for obvious reasons. It was not soon after that Smiles returned from his...venture. Three questions, huh? Thinking for a moment, she wasn't too sure what would actually be helpful to know given the situation. After a little more thought, Aurelia decided to ask, "Have there been any instances where someone has gained their freedom, organizer-approved or otherwise?" "Nope," Smile said bluntly. "If there was a way out of here, I certainly wouldn't be stuck in this hell hole. Their precautions are flawless. They cover everything."